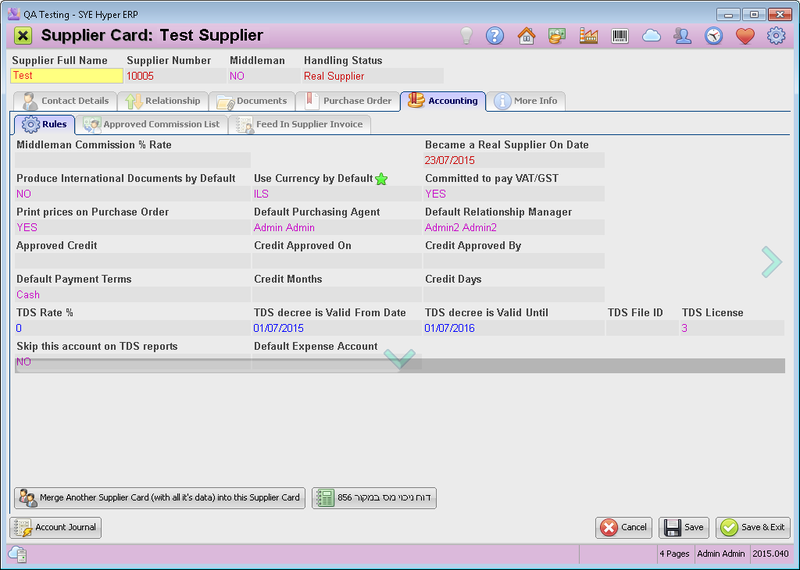 The Accounting tab of the supplier card displays the accounting rules, payment terms, commissions and invoices of the supplier. Rules - Define all of the accounting rules and terms for the supplier. Approved Commission List - Fill in the approved commission for the supplier. Feed In Supplier Invoice - Feed in invoices to create a bookkeeping entry. Produce International Documents by Default Choose YES to produce all of the supplier's documents in English. Use Currency by Default Choose the required currency for the formal document of the client. Default Payment Terms Choose the payment terms for the supplier. According to these terms, the "Credit Month" and "Credit Days" fields will be available. 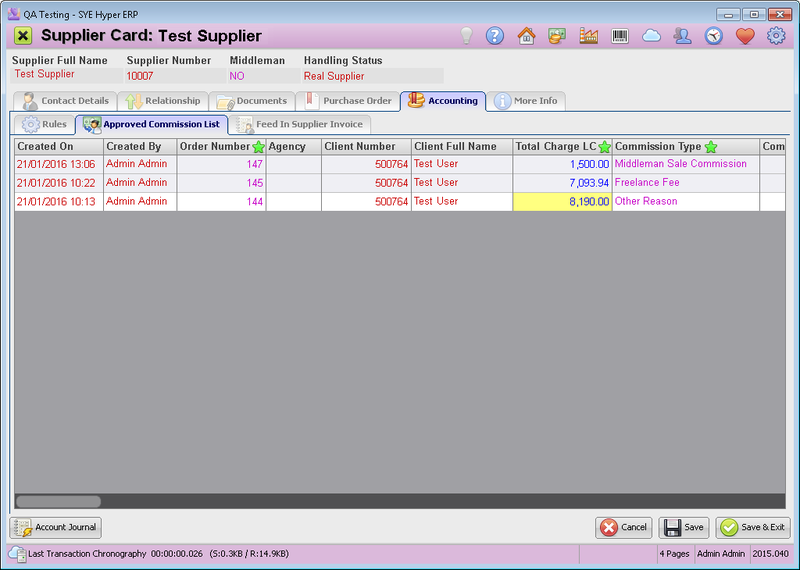 Use the Merge Another Supplier Card button, to merge a selected Supplier card into this card (with all it's data). The additional information from the merged supplier card will be added to a new "Additional Contact" in this supplier card. This table presents all of the approved commissions of the supplier. Add a new row to the table by pressing Ctrl+Enter. Alternatively right click on the table and choose the "Add New Row" option from the displayed options. Order Number In order to approve commission according to sales, select the relevant order from the orders table. Total Charge LC The total charge of the selected order. This value can be manually modified by the user. Commission Type Choose the commission type from the list: Middleman Sale Commission / Freelance Fee / Other Reason. Commission % Rate The % Rate of the commission, that will be calculated according to the value of the "Total Charge LC" field. Fill in the required details in the rest of the optional fields according to the requirements. Please Note - All of the details in this tab are used for following up and do not effect any other areas or modules of Hyper. This tool allows the user to feed in invoices in order to create bookkeeping entries and make payments. For further information click here.